As most of you know last month we took a long road trip across the country to Florida. Before we left we told family and friends about our trip and the question we heard most often was "are you going to Disney World?" We had given it a lot of thought before we planned this adventure and we decided on no. Now I know that might be shocking for some of you that a family would travel 2300 miles to Florida and not go to Disney World, but I believe it was the best decision we made! 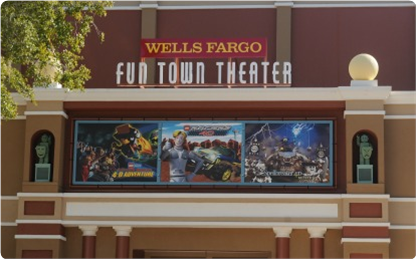 The cost is considerably lower to visit LEGOLAND, plus they have amazing deals that come up all the time! 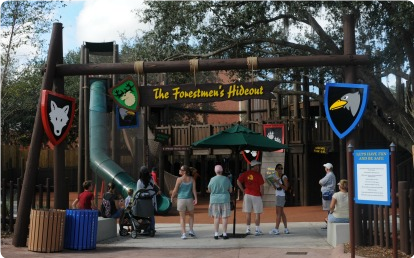 Especially for Florida residents, while we were visiting residents could get into the park for only $25!! Be sure to check the LEGOLAND site and the KGS site for specials and deals! 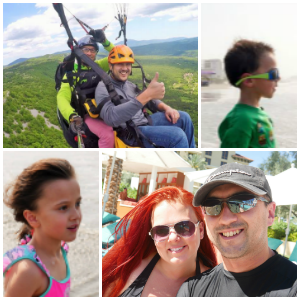 My husband and I talk about it and decided that Disney World is something you do by itself, there is no time to fit in anything else and we had other things we wanted to do while in Florida. Also I think our kids are way too young to really get the most out of Disney World. LEGOLAND was really the best option for them. 1. The age of your children will make a huge impact on how much you will enjoy the park. We had my two kiddos ages 3 and 4 and my nephews ages 10 and 12. 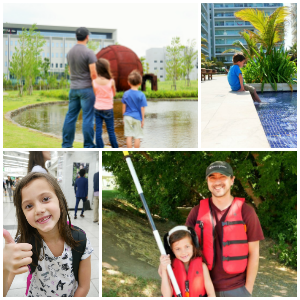 LEGOLAND was perfect for my kids! My little girl was tall enough to go on most of the coasters which I know would not be the case at Disney World. 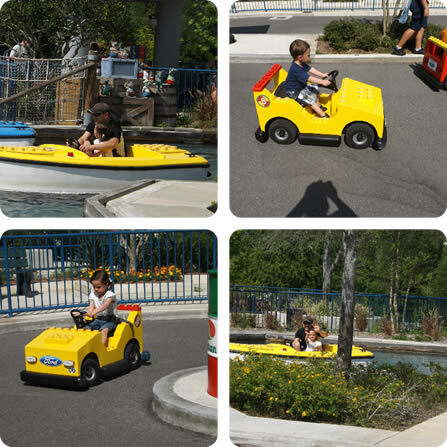 LEGOLAND has rides that your kids can actually control and drive! This gave them the opportunity to really be involved and to be independent. Also gave them the chance to drive in the wrong direction and run into others. My nephews also had fun at the park but I really feel like LEGOLAND was meant for ages 3-11. If you are looking for non-stop thrill rides this is not the park for you. LEGOLAND has plenty of fun rides, but it'd not non-stop coasters. Everyone knows the expression "Rome wasn't built in a day" well... Disney World wasn't built to be able to see in a day, but Legoland is! 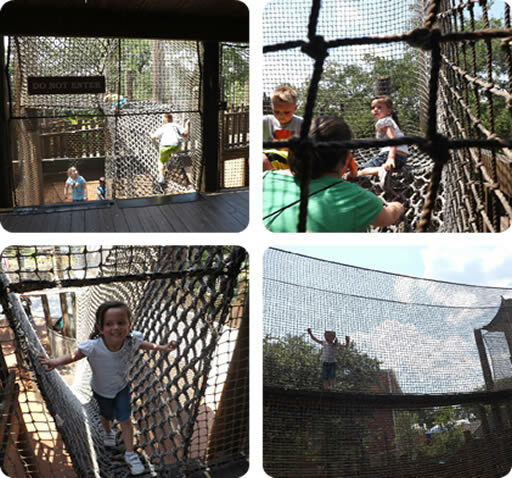 Now that's not to say that Legoland doesn't have a lot to offer, it does, but it just means that you can take your time and relax at Legoland. No need to run around getting a months worth of cardio exercise in on one day! We did about 85% of the park in 6 hours. We went on a day when they had shorter hours, but we still didn't feel rushed. 3. Do you want to spend all of your time standing in lines? I can't stand spending an hour standing in a line just to ride a ride for only a few minutes. 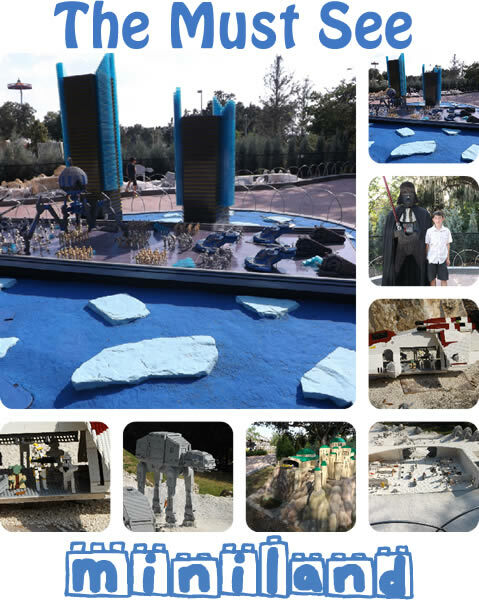 If you hate it just as much as I do then you will love LEGOLAND! We walked up to some rides that said the wait time was 15 minutes, but they all turned out to be only a couple of minutes! We never had to wait more then 5 minutes to get on a ride! And if you do find yourself waiting to get on a ride LEGOLAND has you covered! They have Lego building stations at every ride, so the kiddos can build something while you wait. How awesome is that?!! One thing that I loved about LEGOLAND was all the different Lego statues all over the park that make for wonderful photo opportunities. And unlike a museum or other parks you can touch them and the kids can play on them! My little girl loved the dinosaur. If you have been to Florida then you know how hot and humid it can get. The day we went was no different! I felt like I was melting after only 10 minutes outside. Thank goodness LEGOLAND had a solution! They have plenty of awesome activities inside where you can soak in all that sweet air conditioning! My little boy's cheeks started to get really red and toasty so we went into the Lego building room pictured above. Everywhere we turned there was a play area for the kids to get out some of their extra energy and to get out of the hot sun. My daughter was so excited when she saw the Forestmen's Hideout. She wanted to stay their all day! If you find that you are there on a super hot day be sure to head over to the water park! This was a pretty awesome water park, better than anything we have in Utah. My only issue... worrying about loosing my kids in this amazing water filled maze! So be sure to pack your swimsuits and tons of sunscreen! If you do forget something they have pretty much anything you would ever need inside the park. I can't even begin to express how much I loved that they had free life vests for the kiddos. With a 3 and a 4 year old this gave me more piece of mind that they were safer as they played in the water. Now you know me and I will try to save a dollar anywhere that I can! Luckily LEGOLAND makes this task even easier by allowing you to bring in a cooler to the park! 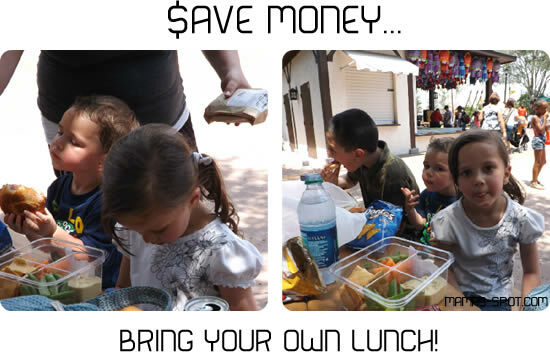 So we packed up sandwiches and other goodies that we thought we would need for the day and saved a ton of money! Plus they have little picnic tables all over the park and most of them are in the shade. Also we found out really quick that we needed a lot of water to keep us hydrated and we were really glad to have our little cooler on wheels. If you do decide to eat at the park instead the prices aren't as bad as I thought they would be. Kids meals were around $5 and meals for adults were between $7-$10. You can also save money on souvenirs by heading over to the courtesy desk and picking up a FREE button! They have some for first time guest and for birthday guests! If you decide to head into some of the shops you can still find some great frugal souvenirs. I saw quite a few items that were clearanced and little Lego people for only $2.99! One thing I wasn't expecting at the park was how super friendly the staff was. They were so helpful and you could find someone pretty much anywhere in the park. My little boy really wanted to do the Ford Jr. Driving School, but once he got on it he was a little confused on pushing the gas peddle. I felt bad watching him sit there while everyone raced around him, but within less than a minute a super friendly staff member rushed over and pushed his car around the track for him! You can see by her determined look, she was trying to get her brother in the picture above. One of the last things you will probably see on your way out of the park is Miniland! I knew it would be cool, but I had no idea it would be as cool as it was! I couldn't believe how amazing it was! The detail was unbelievable! We took so many pictures I unfortunately couldn't fit them all in this post. Make sure you leave enough time to really be able to explore this area. 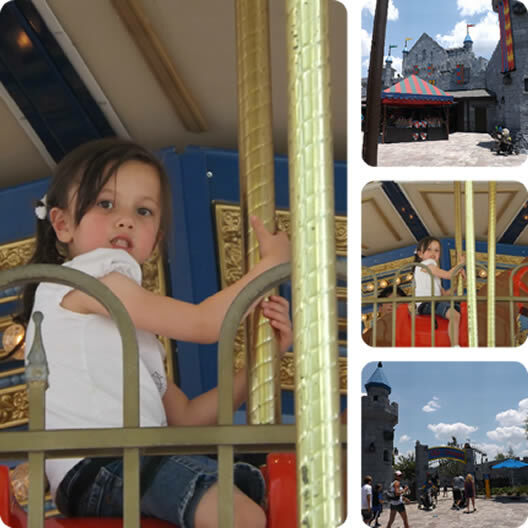 This was definitely the best place to take the kiddos, the ride lines were short, they were tailored to younger kids, and we could fit it all in one day. If the cost and everything about Disney World seems just too overwhelming, I would highly recommend skipping it and heading over to LEGOLAND instead! It's definitely the most relaxing park experience I have ever had, and I would go again in a heartbeat! 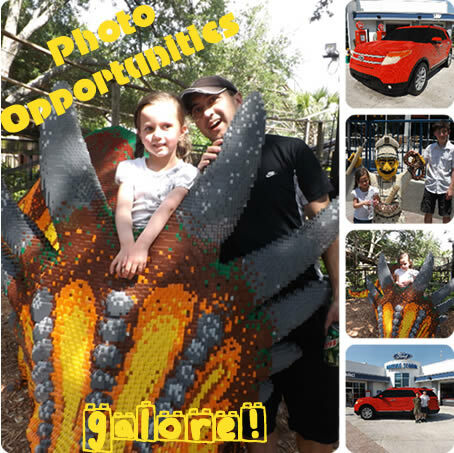 I want to give a huge thank you to LEGOLAND Florida and KGS for this awesome experience!